There are a few specialized things that student athletes need to do in order to be considered for recruitment by colleges and universities. The most important thing is to file with the NCAA Clearinghouse. Student athletes should do this at the END of their junior year or the very beginning of senior year. You will need to take the SAT or ACT before the end of junior year in order to be eligible for the clearinghouse. You must also send in an official transcript with all courses from junior year listed. 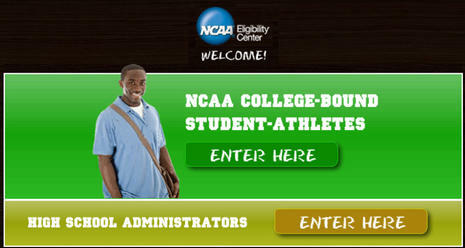 FEE WAIVERS FOR THE NCAA CLEARINGHOUSE ARE AVAILABLE AT THE NCAA WEBSITE! In order to be eligible for the NCAA Clearinghouse, students must take the appropriate number of academic courses. Students should speak to their counselor to ensure they are taking the right courses for eligibility. NCSA Recruitment Information for those interested. Your ability to become a member of any high school sport team in LAUSD is based upon a number of factors, but one of the most important is your academic eligibility. LAUSD requires a minimum 2.0 GPA (Grade Point Average), or a certain number of grade points, in at least four (4) classes to be eligible to play a sport. Your final report card at the end of each semester (fall or spring) is what is typically used to determine your eligibility depending upon what season your sport falls under. 2. Once you have added together all of your grades, divide by the number of classes you are enrolled in. Check below to see if that number meets the minimum eligibility requirements. If you have 6 classes, you need a minimum of 12 points. If you have 7 classes, you need a minimum of 14 points. If you have 8 classes, then you need a minimum of 16 points. Please note: Some online courses such as Edgenuity are not accepted through the NCAA requirements for GPA calculation.